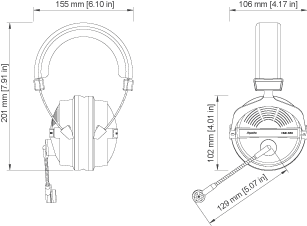 The HMC660 series of stereo headsets are designed for the professionals that demand high quality monitoring and communication. Their precision acoustic design, integrating drivers, ear padding, and headband, combined with a professional condenser microphone for a balanced tone with high dynamic range make these headsets perfect for both listening and talking. They are ideal for live broadcasts, DJ's, desktop video conferences, on-line gaming and multimedia applications.